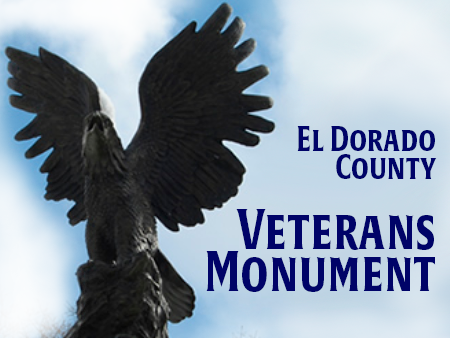 The El Dorado County Veterans Monument was first envisioned by former United States Marine, Richard W. Buchanan, during the Vietnam War, where he was awarded the Navy Cross for upholding the highest traditions of the Marine Corps and the United States Naval Services. On May 24, 1968, as 3rd Battalion, 27th Marines moved against well-entrenched enemy forces during the battle of Le Bac (1), Buchanan witnessed numerous examples of the American fighting spirit and selfless devotion to duty by his fellow Marines and Corpsmen. He vowed that their dedication, and the dedication and sacrifices of other men and women of our armed forces, would not be forgotten. The vision was shared with architect LCDR Peter Wolfe, USCG (RET), in 1997. Commander Wolfe served as an officer on high- endurance cutters and was awarded the Humanitarian Service Medal for search and rescue and law enforcement. Both former military men agreed that a tribute should be built honoring the dedication, high purpose, and sacrifices of all past, present, and future Veterans of the United States Armed Forces. The Monument site selected overlooks the Sierra Nevada Mountains in Placerville, California, and will occupy most of its two-acre site at the El Dorado County Government Center, east of building A, at the intersection of Fair Lane and Ray Lawyer Drive. The Monument components will include a 114-foot monument wall, which will serve as a base for the American flag. The Monument Plaza will seat 300 and includes ten additional flag poles honoring our Armed Forces, Veterans Administration, POWs, Veterans Organizations, and California. The 112-foot long entrance will be graced by a life-sized bronze American eagle and includes the Walk of Honor and the Circle of Honor, where most of the 1000 engraved bricks honoring our American Veterans will be displayed. The Circle of Honor base will be an engraved map of the world, calling attention to areas in the world where are our armed forces have served the cause of freedom. This monument will be a significant addition to monuments across our nation, and appropriately symbolizes the freedoms, institutions, and way of life that our veterans have gallantly sacrificed to protect.